Michael Emmett Brady, Amazon Books, July 8, 2007. Annotation, Reference & Research Book News, August 2002. 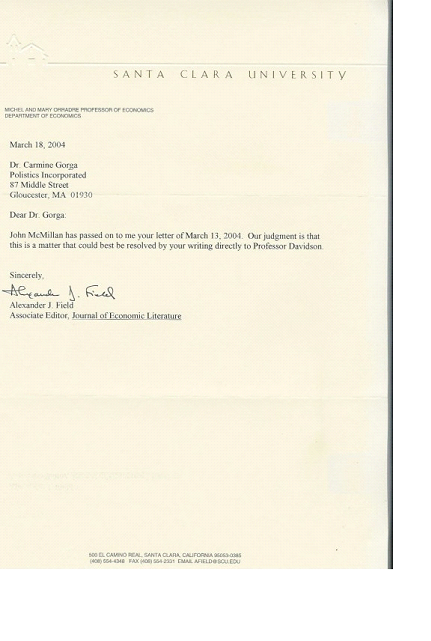 Book Citation, Journal of Economic Literature, December 2002. Mark Broski, Journal of Markets and Morality, Volume 6, Number 1, Spring 2003, pp. 297-98. Carmine Gorga, Rebuttal, July 25, 2007. Paul Davidson, Journal of Economic Literature, Vol. XLI (December 2003), pp. 1284-1285. Carmine Gorga, Rebuttal, May 18, 2005. Author's review for Amazon Books. Vincent Ferrini, "Gorga worthy of note", Gloucester Daily Times, December 11, 2002, p. A6. I=C, I love it! In fact, I think Keynes’s General Theory is incoherent without it. I can’t understand why a brilliant guy like your friend Modigliani didn’t get it. And what an abomination of Paul Davidson to press upon your book the scarlet letters I=H, and without so much as an apology. Augh! Of course, Davidson, as the self-appointed keeper of Keynes’s (not Keynesian) orthodoxy, was perhaps not the best choice of reviewers. Someday, I=C will shift from radically ridiculous to patently obvious. I hope you get some of the credit. This book will be extremely difficult to follow for a " modern" mainstream economist brought up on general equilibrium theory(g.e.t) and the stochastic version of g.e.t based on the assumption that all the relevant variables in any macro model of the economy can be analyzed either as( or as if) they were random variables that are independently and identically distributed so that some type of normal distribution(log normal,bivariate normal,multivariate normal,etc. )can be assumed, based on the central limit theorem,to apply to the time series data generated by capitalist economies. 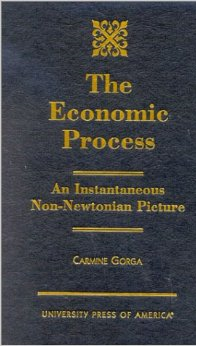 The writing style of the book is similar to the writing styles of Veblen,Schumpeter,Keynes,and von Hayek.This means that the reader is going to have to think carefully about the fundamental nature of capitalism as a complex system evolving through time.Gorga's(G) concern is to identify what the fundamental problem is that prevents such a system from obtaining AND MAINTAINING a full employment level of output.Why is such an economy subject to a destabilizing boom-bust business cycle over time ? G is one of the very few economists to identify the fundamental problem as hoarding behavior.Hoarding means that the individual is not spending his income on consumption goods,investment goods,public goods,exported goods or imported goods.Hoarding problems will manifest themselves at the macroscopic level.Thus,involuntary unemployment can be identified as a macro problem that results from the microscopic hoarding behaviors of many individuals but will not be susceptible to a purely micro analysis based on utility maximization subject to an income constraint problem.It is an effective demand problem that shows up at the aggregate level.This,naturally,may present a major stumbling block for a modern day economist who believes that all macro behavior is merely the sum of all microbehavior. G's framework of analysis is a reinterpretation of Keynes's syllogistic (double entry accounting) model of chapters 6(pp.63-65)and 10 that deals with the actual results.This is Keynes's simplist model and it can be used be demonstrate or establish the multiple equilibrium nature of the capitalist economy.Keynes' model specifies a positive relationship between consumption and investment spending(the aggregate demand side)that conflicts with the necessity for consumption goods and investment goods to be negatively related from the production side(aggregate supply side)of the analysis since full employment of all resources can only take place on the boundary of a production possibilities frontier.This boundary must have a negative slope.Keynes has introduced the possibility of a positive feedback effect.This effect is destabilizing.Speculative behavior can have catastrophic results if the commercial banking system is allowed to provide loans to speculators(hoarders)that allows them to try to leverage their private hoards so as to accumulate even more.For instance,Milton Friedman rejected Keynes's analysis because he felt that it was based on "excessive " liquidity preference.Naturally,Friedman views speculative behavior as stabilizing since he argues that it takes place under conditions of risk and not uncertainty.This distinction is fundamental Eliminating uncertainty and ignorance from decision making effectively eliminates hoarding behavior as anegative. Keynes' model specification,however,does not allow him to specifically answer the question of why the economy is unstable.Keynes's answer is that the economy is unstable and suboptimal because of the propensity to hoard.Keynes calls this also by the name liquidity preference.Keynes can't show this in the Y=C+I modelsince there is no explicit role for money to play.Instead,Keynes demonstrates this in the expectations-uncertainty D-Z model of chapters 20 and 21.Keynes 's result is that if L2(the speculative demand for money) is greater than 0,you will have involuntary unemployment,which will increase as L2 increases.Gorga's reinterpretation of the Y model allows him to reach Keynes's conclusion as well as integrating it into a complex systems analysis(non Newtonian)as the economy evolves as a dynamic process over time. G also shows that this is the major problem that has impacted all types of economies over the last 4,000 years and not just capitalist economies.This is also the major economic problem that has been identified by the Roman Catholic church during the many centuries that humans were subject to great uncertainty.Technically,it is impossible to eliminate all uncertainty which means that hoarding will be a problem.However,once identified,it's negative impact can be reduced to a minimum.Keynes states this on pp.241-42 and 351-52 but does not emphasize it for his economist audience.G emphasizes it and convincingly identifies it as the main problem. There is one technical problem that appears throughout the book which may lead to confusion on the part of the reader.This is G's use of the symbol "=".This symbol must be interpreted to mean equivalence or equivalent to.I have deducted 1/2 of a star for this drawback.It can be remedied in a future edition.I would then give the book a 5 star rating. The Economic Process transforms economic theory from a linear, sequential discipline into a structure in which events happen simultaneously and are strictly interrelated. Author Carmine Gorga describes the process of production of real goods and services, the automatic distribution of ownership rights over these goods and services, and the creation of money as legal representation of those rights, through financial instruments. Making minimal use of mathematics and an in-depth use of ancient tools of logic and epistemology, each module of the economic system is analyzed by itself and is then seen in relation to all the other elements of the economic process. Gorga undercuts the ideological polarization that exists today between the right and the left to provide only one political and sociological view of the economic problem: the problem of poverty. The Economic Process; an Instantaneous Non-newtonian Picture. Arguing that economists have been reasoning more like natural than social scientists and that they have naively trusted in the power of mathematics to rescue economics from its inability to comprehend the reality of concrete human beings and institutions, economist Gorga attempts to recenter formal logic as a foundation of economic discourse. Focusing on the shifting meaning of savings and its relationship to investment, consumption, and income, he argues that applying formal logic to economics allows theorists to bring the supply, demand, and institutional sides of economics into concord. Annotation c. Book News, Inc., Portland, OR (booknews.com), August 2002 issue of Reference & Research Book News. Annotation Describes the economic process, restructures contemporary economic theory using the tools of logic, and presents a new structure called Concordian economics. Discusses John Maynard Keynes's thought as the apex of classical economics; a Concordian economics that takes its lead from the economics of Keynes; the lack of homogeneity in Keynes's model; the simplicism and forced doublespeak of Keynes's model; the lack of true equivalence in Keynes's model; the classification of mainstream economic analysis as rational economics; the dissection of Keynes's model and the dissolution of the saving-investment nexus; the history of the word "saving"; the need to go beyond Adam Smith's conception of saving and beyond Keynes's "definition" of investment; the definition of saving, hoarding, and investment; the real saving-investment system; the process of turning Keynes' model of the economic system inside out or turning mainstream economics into Concordian economics; the concept of consumption; the concept of income and the flows model as a whole; the economic process as a whole; simplistic descriptions of the economic process; the production process; the consumption process; the distribution process; economic growth as the normal outcome of the unfolding of the economic process; inflation as an outcome of the economic process gone awry; how the newly introduced models close the gap between macro- and microeconomics; poverty and the economic process; and the elimination of absolute poverty through the right to create all the wealth one needs. Gorga is President of Polis-tics Inc., a private economic consulting firm. Index. A much better title for this book would have been simply: “The Costs of Hoarding.” Carmine Gorga does put his finger on an economic reality often neglected by economists. Not all wealth is put to productive uses, and, when wealth is wasted in this way-hoarded-bad things happen to the economy. Instead of stopping there, Gorga pushes his argument too far. He argues that the neglect of hoarding by economic theory means that all of economic theory needs to be rebuilt from the ground up. That includes everything from the theory of the firm to monetary theory to the theory of consumer behavior. And Gorga, in one volume of overwrought and discontinuous thought, attempts to do just that. This is similar to the charge that every single problem in the Catholic Church in the last thirty years has been caused by the abandonment of the Latin liturgy. Imagine writing three hundred fifty pages explaining how Christian doctrine, governance, and spirituality have been destroyed by the vernacular. In Gorga's case, those pages would all explain how two hundred years of economic thought have nearly been for naught due to the omission of hoarding as the centerpiece of analysis. Not surprisingly, one must gravely oversimplify these issues in order to make such a claim. Most economists would stipulate that hoarding hurts the economy. The individual who chooses to give up liquidity for useless material goods makes a bad bargain for himself. Ultimately, the market punishes those who engage in a strategy of self-impoverishment. If enough people hoard their wealth, the size of the economy would certainly shrink. But why would anyone do this? What evidence is there that individuals and firms pass up genuine profit opportunities for the option of burying their talents in the ground? Gorga provides no empirical evidence that hoarding is a significant problem. If it were a significant problem, then perhaps the issue would deserve some tightly focused attention. It should be obvious from this summary that this book is far from the mainstream in economic thought. There is little here that will attract the interest of those who follow the progress of economic science. Gorga's book proves that it is much easier to attempt to reinvent the wheel from a new physics than it is to make real, though limited, contribution in the marketplace of economic ideas. What is unfortunate is that Gorga missed an opportunity to bring to bear his substantial background in classical economics on an analysis of the causes of hoarding. Clearly, people hoard as a hedge against uncertainty. It is true that the basic Keynesian spending model does not account for this possibility. In that case, the amount of savings by households might not equal the amount spent in investment by firms. Hoarding, then, must be a function of a household's effective time horizon, the stability of recent economic activity, and the availability of reliable information about the future. Thus, the economic significance of hoarding ought to be inversely proportional to economic stability. One might see a great deal of hoarding, with grave negative consequences, in societies where property rights are insecure, where contracts are not enforced, or where monetary mismanagement destroys the reliability of the price mechanism. What might result would be empirically testable propositions that could be tested in sub-Saharan Africa, in contemporary Argentina, or in any other place where the invisible hand has ceased to function. Gorga would agree that hoarding is fundamentally a moral issue, something that should be of great interest to those concerned with ethics in the marketplace, but he missed an opportunity to explore the function of all those economic institutions-the savings bank, the mutual fund, the insurance company-that serve to deter hoarding by offering a less-costly hedge against disaster. The fact is that the existence of hoarding represents a profit opportunity to those firms that can find a way to eliminate it. It may be that the existence of hoarding may not represent a moral failure as much as it reflects the failure of institutions that should correct it. Indeed, the real story here is how little hoarding there is, rather than how much. It is important to remember that modern economic theories are not meant to be descriptively accurate. They are meant to be testable by empirical means, but the most testable theories are the simplest, the same ones that seem least plausible in terms of their assumptions. The one thing that the theory strives for is microfoundations, a theory grounded in the behavior of rational, self-interested firms and individuals. This does not mean that there is no room for a reflective philosophy of the free market system, a philosophy that operates from a richer set of assumptions. But if one wants to invent a new science of economics, as Gorga seems to attempt with his self-branded Concordian economics, then one must enter the ongoing conversation more humbly, with less-extravagant claims. Economists do not physically see hoarding; hence, as Broski has done, they intellectually deny its existence. The issue is not one of economics. The issue is one of mathematics and logic: once the economic reality is described by the given definitions of saving and consumption, saving becomes “equal” to investment (cf. Keynes 1936, p. 63), and no space is left for hoarding. Through the new framework of analysis designed in Gorga (2002, pp. 23-40, 67-158, 303-328), it is again possible to speak of hoarding within the context of formal economic theory. Many consequences ensue from the existence of hoarding (cf. ibid., pp. 235-302, 329-358). So many effects, indeed, to induce Broski (2003) to maintain that “A much better title for this book would have been simply: `The Costs of Hoarding. '” Yet, even accepting the validity of the new intellectual construction that includes hoarding in its purview, a doubt evidently persisted in Broski about the existence of hoarding. This doubt is creating an interesting consequence that can be explained only in terms of the relationship between intellectual paradigms and real phenomena. Thomas E. Kuhn in The Structure of Scientific Revolutions pointed out that the prevailing paradigm in physics for a long time made scientists see a substance, phlogiston, which eventually turned out to be a non-existent element. In economics today, there is a reverse chain of causation. Since economists deny the existence of hoarding, they tend to conclude with Broski that there is no reason for a new intellectual construction such as elaborated in Gorga (2002) that unarguably permits its vision. Hence this attempt to clarify three questions: What is hoarding? Is there any hoarding? Who does the hoarding? This exposition makes it clear that, in daily reality, hoarding has a direct effect on the projection of future economic activity as well as on our understanding of the economic literature of the last 250 years. Hoarding is the act of keeping wealth in an idle state. Hoarding is the act of keeping wealth in an idle state for any reason apart from a technical requirement for keeping it idle. More specifically, hoarded is all wealth that is not used, at the moment of the observation, as a consumer good or a capital good. Before starting the discussion, we shall equip ourselves with an ad hoc methodology and a minimalist economic theory that will allow us to see hoarding. We shall abstract from the theoretical possibility or impossibility of the existence of hoarding. We shall be totally indifferent to either one of these two theoretical possibilities. In other words, the primary focus of this Appendix is not on any of the effects of hoarding, but on hoarding in itself and by itself. Yet, nothing stands alone. Therefore, at times we shall call attention to some effects of hoarding; and, given that any economic action has effects on quantities and relative prices, we shall reason by excess. Whenever necessary and appropriate, we shall run a peculiar thought experiment (cf. Kuhn 1996, p. 88); we shall assume that the entire stock of a particular item of wealth falls under the exclusive control of only one person. As an inescapable consequence of the given definition of hoarding, all wealth is posited to be divided into three parts: consumer goods, capital goods, and goods hoarded. This is a minimalist theory, but a theory nonetheless. The assumption is that any item of wealth-not simply money-can be hoarded. Currency. Currency hoarded is the simplest case to identify. Currency under the mattress in excess of the need for daily transactions, as well as currency kept in a safe deposit box, is money hoarded. It is money kept idle. A more complex variant of this phenomenon is money that is owned by a bank while keeping it idle in a safe deposit box. That currency is also hoarded. Let us remember that the object of our observation is the specific item of wealth, not its owner, and that here we are not primarily concerned with either the causes or the effects of hoarding. Land. Land hoarded is simple to identify. All land that is used neither as a consumer good (e.g., for recreational purposes) nor as a capital good is land hoarded. Land that is kept idle for the esthetic pleasure of looking at it is not land hoarded but land used as any other consumer good. All land that a government keeps idle for recreational purposes is not land hoarded; yet land in an unvisited park is land hoarded. Land covered with weeds and rubbish in the downtown of a city is clearly land hoarded. All uncultivated and undeveloped (landlocked) land is also hoarded. All land kept idle in a country in which there are idle hands that would till or somehow make use of it, is land that is clearly hoarded; see, e.g. latifundia. Gold. Gold in the course of extraction and sale in a gold mine is a capital good. Gold in a microchip plant or a jeweler's workshop is also a capital good. An interesting case is the case of a gold bracelet in a jeweler's shop: this is still a capital good. It is only when the bracelet adorns a woman's wrist that the item becomes a consumer good. And what is a gold ingot at Fort Knox if not, clearly, a good hoarded? And so is the gold ingot in the safe of a bank, whether a private person or the bank itself happens to be its owner. Supplies. Supplies are clearly capital goods; yet, even supplies can be hoarded-as they are when they are bought and kept idle for a period of time that goes beyond technical reasons for keeping them idle. One might say that when the physical flow of supplies is changed into a stock of supplies, chances are that those supplies are hoarded. When in the 70s oil was kept in tankers waiting outside harbors, that oil was hoarded. Some of this oil was hoarded to staunch the effect of expected higher prices; some of it was hoarded in fear of future exhaustion of those supplies. The reason does not matter. It is the economic condition that matters. A coffee cup. A coffee cup in my home is a consumer good. A coffee cup in my office is a capital good. And a coffee cup in my attic is a good hoarded-unless I use it, even just once a year, on my patio during summertime. Consumer goods. The hardest case to identify as hoarding, at least the last case that was identified by this writer, is the case of the hoarding of consumer goods. (Unless the eyes are never peeled away from the economic reality, words become utterly misleading.) Again the case of voluntary hoarding is clear. The case of the person who buys two pairs of boots because prices are skyrocketing is clear: one pair is used as consumer goods and the other is hoarded. More subtle is the case of unanticipated hoarding. Have you ever discovered in your clothes closet a shirt with its price tag still attached after a couple of years of its purchase? The item was clearly hoarded. More deviant still is the case of “consumer goods” that have lost their utility to the owner, and are hoarded because one is too lazy to offer them to others who would put them to good use. Any item of wealth can be hoarded. During the Great Inflation of the 70s Johnny Carson, the famous comedian, one night made a joke about the disappearance of tissue paper. The day after the shelves were bare. A shortage was created because of the unexpected demand. Indeed, much of the gasoline shortage those same years was created by the fact that many drivers would tend to keep the tank constantly filled. They were hoarding gasoline. Stocks and bonds. Stocks and bonds are not wealth; they represent wealth. Therefore, they cannot be hoarded-even though the corporation in whose name those stocks and bonds are issued might be hoarding some real wealth on its own account. No matter how many consequences derive from accumulating even all the stock of a corporation, this action does not directly affect other people's wealth; at the limit, you can destroy all the stock certificates that you own, and you do not directly affect other people's wealth. Other people would benefit from a transfer of the title of ownership of these certificates to them, but that is a moral issue with its own indirect economic consequences. Directly, the wealth of the nation would not even minimally be affected by the destruction or transfer of stocks and bonds; indirectly, you might increase the value of the remaining stock certificates, but that would only be a monetary change. Currency is significantly different from stocks and bonds. To say the least, currency has an immediate and direct utility. Accumulate or destroy all currency, and you do not destroy the value of any real wealth; yet you immediately make all exchanges more cumbersome and gradually more expensive. As a saying once went, currency saves shoe leather. This is the cost-in real wealth-that would be incurred by the nation if all currency were destroyed. Labor. To evaluate the full cost of hoarding incurred by a nation, one has to realize that involuntary unemployment is labor power that is hoarded. To reach an accurate measurement of this phenomenon, one has to keep in mind, first, that official unemployment rates from the ghettos to the Indian Reservations generally vary anywhere from 15% to 75%; second, that official statistics measure unemployment only among those who are still actively searching for employment: those who have given up are not counted. Another group that might be worth to look at with new eyes is the pool of officially retired people. The specific question is: Is there any hoarding any time, anywhere in the world? To answer this question in relation to money, it is important to bring to mind two specific examples. First, the less developed the banking system in a country, the more hoarding takes place under the mattress. The deeper the condition of economic depression in a country, the higher the accumulation of money hoarded in a bank-by a bank. How much deeper did the Great Depression become because banks could not find borrowers for their hoards? To clearly see hoarding, one has to make a dynamic and longitudinal analysis of the issue. One will then discover that the quantity of certain forms of hoarding increases over time. During the same period, other forms decrease: currency, for instance, is hoarded less when the prices of goods rise. (This is another variation of Gresham's Law.) But of course the calculation has to take into account that the amount of currency in circulation depends on the will of the people as well as the willingness of the monetary system to accommodate that demand. The condition is wholly dynamic. These observations lead to another consideration. At first sight, one might be tempted to assume that all hoarding is “bad” or more specifically that all hoarding has negative economics effects. That is not necessarily the case. Some hoarding might cause positive effects for the individual person as well as for society as a whole. For instance, some undeveloped and uncultivated (landlocked) land might become a buried treasure for the next generation; and some money kept in a safe deposit box keeps prices rising even minimally at a slower pace. There are no general cases in economics; all cases are individual ones. That is why one cannot let “the market” make decisions for oneself. We all hoard wealth. Some more, some less, but we all hoard wealth. Even in this brief excursus we have met governments hoarding gold, landlords hoarding land, bankers hoarding currency, industrialists hoarding supplies, and individual human beings hording consumer goods. A disclosure: One of the two writers hoards books and computers: there are some books that he knows full well he will never get to read or no longer needs to read; there are some computers that he knows full well he will never get to use-he should give them away, instead he hoards them. The existence of hoarding is proof positive of the existence of freedom, rather than determinism, in the world of economics. As against the accumulation of goods hoarded, the consumption of consumer goods is, indeed, determined by need: needs of physical survival and needs of social status. The consumption of capital goods is also determined by the need to reduce the amount of time-more precisely-the amount of life one devotes to the production of goods; the resulting free time is proof positive of the efficiency of the economic system in which one lives; to whom and to what one devotes the resulting free time is determined by the degree of civilization and spirituality stored in this person's character. Is not the existence of hoarding, then, proof positive of the amount of freedom granted to the individual person by the economic system in which one lives? And the amount of dishoarding, by giving one's surplus wealth to the people who need it and cannot produce it for themselves, is proof positive of the degree of morality lived by the person who dishoards. Clearly, neither consumption nor investment, but hoarding alone is wholly determined by the free will of the individual economic agent. Hoarding is an arbitrary and subjective activity. Of course, there is much arbitrariness and subjectivity in consumption and investment as well. To say the least, then, hoarding contains a greater degree of arbitrariness and subjectivity than either consumption or investment. At the limit, as we know, differences in degree are differences in kind. Hoarding therefore is an economic activity fundamentally different from consumption and investment. The discovery of the existence of hoarding in the economic system is not an exclusively intellectual issue. The existence of hoarding has a clear concrete effect on the measurement of economic activity. Hoarding can be measured only by working in close collaboration with the person who does the hoarding. All other measurements are purely arbitrary. Any national projection of future economic activity that does not take this characteristic of hoarding into full account is destined to remain entirely ambiguous. Once recognized, the phenomenon of hoarding will eventually be classified as a Kuhnian anomaly. Finally, the phenomenon casts a new light on the understanding of the economic literature of the last 250 years. The existence of hoarding has a decisive influence on the understanding of Keynes' General Theory. Hoarding is what fills the gap between the form and the substance of that masterpiece. While the form is written on the basis of Keynes' model of the economic system as presented at page 63, the substance of the General Theory is written in terms of the existence of hoarding. Three major pieces of evidence should suffice. First, if there were no hoarding in the economic system it would make no difference whether people had a propensity to consume a little less than one's income (Keynes 1936, p. 96), because the difference would be taken up by saving and investing. Yet, Keynes knew full well that there is hoarding in the community and therefore he specified that under given circumstances “saving and spending will both decrease” (ibid. p. 111; italics in original). With the recognition of hoarding, this observation turns out to be true in a static examination of the economic system, as well as in a dynamic investigation of the system. The second case regards Keynes' prescription for the “only radical cure for the crises of confidence which afflict the economic life of the modern world” (ibid. p. 161); as analyzed in Gorga (2002, esp. pp. 93-115), the prescription becomes clear only if one takes the existence of hoarding into account. Third, Keynes defined interest in an outright fashion as “the reward of not-hoarding” (ibid. p. 174). Going farther back in history, it is evident that the absence of a clear definition of hoarding doomed the discussion that occurred between 1926 and 1933 among Ramsey, Sraffa, Hawtrey, Robertson, and Keynes on the definition of saving. The Great Debate was such a debacle that economists are still shying away from attempting to define terms in economics. And going farther back still, one finds the source of today's quandary. Hoarding was well known and widely discussed from Moses through Jesus of the Parable of the Talents to Locke (1698, esp. Bk. II, Ch. V, pars. 46-51). It was Adam Smith who, by destroying in the Wealth of Nations (WN) the distinction between saving and investment, and conflating them in the word “accumulation”, left no room for the understanding of hoarding. To repeat, in formal, mathematical analysis, what is not consumed is saved-and what is saved is considered to be investment. Hence, no room is left for hoarding. Quite consistently, Adam Smith relegated hoarding to the past (WN, pp. 859-60, p. 863) and, quite presciently, hoarding has ever since disappeared from sight. We have seen how the General Theory suffers from a lack of understanding of hoarding; we have seen how tangled the conversation became in the 30s. What is not often remarked is that the first to suffer from such misunderstandings is Adam Smith himself. What most people read or want to read in the Wealth of Nations is the doctrine of “accumulation of riches” (WN, p. 327). Subtleties and qualifications of the great work ought not to, but they do, fall by the wayside. The work is incredibly impoverished. Broski, M. (2003). “The Economic Process: An Instantaneous Non-Newtonian Picture. Carmine Gorga.” Journal of Markets and Morality 6, no. 1: 297-98. Gorga, C. (2002). The Economic Process: An Instantaneous Non-Newtonian Picture. Lanham, MD and Oxford: University Press of America. Keynes, J.M. (1936). The General Theory of Employment, Interest, and Money. Harcourt, Brace, and Company, NY (1964). Kuhn, Thomas S. 1996 ed. The Structure of Scientific Revolutions. Chicago and London: University of Chicago Press. Locke, John. 1698. Two Treatises of Government. London: Awnsham and John Churchill. Laslett P. ed. NY: A Mentor Book (1965). Smith, A. (1776). The Wealth of Nations. Modern Library (Cannan Ed.). Random House, NY. Thurston, William. 2006. Quoted in Dennis Overbye, “An Elusive Proof and Its Elusive Prover: That rabbit is actually a sphere. (Read on.) But the man who proved it is missing,” New York Times, August 15. The book is divided into five parts. Part 1 presents what the author believes are fundamental weaknesses in the model that Keynes developed in The General Theory. Part 2 analyzes why these weaknesses have occurred and why no economist before the author has found these weaknesses. The author then provides “remedial solutions” to these Keynesian weaknesses in terms of Concordian “new models.” Part 3 uses these new models to analyze the real world economic process. Part 4 suggests how Concordian economics “has the potential to destroy the dichotomy between micro and macroeconomics.” Part 5 presents a few discursive comments on what the author believes is the relationship between poverty and the economic system. And what exactly is the analytical key of “Concordian Economics” that allows the author to revolutionize economic analysis? The author claims that since Keynes wrote in 1936, economists have been using the wrong definition of things such as Savings, Investment, Consumption, etc. Once the author has rewritten the economic dictionary of these terms the result is what he calls Concordian economics. And somewhat surprisingly the author indicates that his model was so novel that “I copyrighted this model in 1979” (p. 25). Why no one has ever seen this copyrighted model before now is not explained. The author warns that “nine tenths of the terminological difficulties” that other economists have with his model are the result of his definitions of saving and consumption. In Concordian taxonomy “saving is contracted to mean hoarding (or production, ownership and sale of nonproductive wealth such as money under the mattress, idle gold, idle land, etc.). And the meaning of consumption is expanded to include all expenditure of money or wealth in general; namely, expenditure for the purchase of consumer goods, goods to be hoarded, and capital goods as well as expenditures for financial instruments” (p. 26). Later in the analysis, the last two equations are converted to: I = H and P = D, where H is hoarding, P is production, and D is distribution of ownership rights. (3) Idle machinery and idle land is “saving,” while machinery and land that is being used is a “consumer good” (p. 100). But, I wonder, does this mean that labor that is idle (unemployed) is “saving” in Concordian economics and employed labor is a purchased consumer good? I believe these statements give the reader a flavor for what is contained here. NOTE: I wrote to Professor Davidson; he never answered. I informed the editors at JEL and, so far, they have refused to take any action. Offers a geometric and mathematical representation of the economic system as a whole. In addition, the book formally defines hoarding, includes it into the new structure of economic theory, and observes its effects in the fields of economic growth, inflation, and poverty. Thus it offers the rudiments of a meta theory of sociology -- and, in even smaller doses -- political science. For a number of consilient reasons, I like to call the new structure Concordian economics. 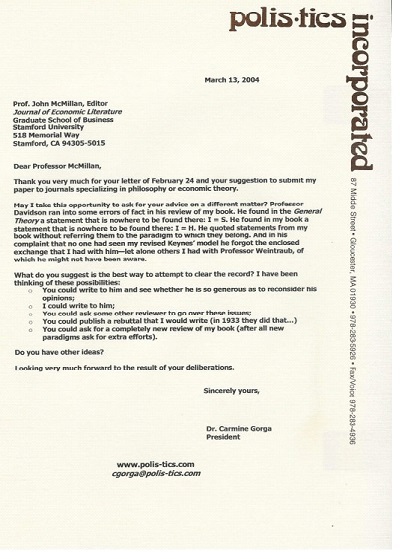 For his enormous intellectual and moral assistance over the years, the book is gratefully dedicated to Professor Franco Modigliani, Institute Professor emeritus at MIT and 1985 Nobel laureate in economics. Carmine Gorga, of the Gloucester Community Development, who studied with Nobel laureates in his discipline, is a practitioner of creative economics. In his book, "The Economic Process," (University Press of America, 2002) he has the answers to universal poverty and the anxieties of the affluent. The blueprint for the elimination of poverty among the masses of the planet. A manual for a healthy mind, in a healthy body, in a healthy society. Gorga is a Ph.D. authority in psychology, physics/metaphysics and his chosen center economics. My ideal real man for the rectification of the stuck human condition. What Gloucesterwas, it can become again. Today flies off before we know it and the future too. Can we make the leap and land into the promise. Without a doubt. I read his book, the first I-IV sections were too abstract for me, incisive for the scholars, but it by passed me without establishing a landing, Part V held me to his anchor and the vessel's engine sang with the practical means for operating a spaceship into cosmic plenty. Gloucester has a destiny for fulfilling i[t]s capabilities and resources in its jurisdictions: the island, the sea, the brains and the energies, marked to deliver the communion. Gorga doesn't miss a shadow. He talks with the angels in the angles, a holistic seeder.